Herbert Clark Hoover (August 10, 1874 – October 20, 1964) was the 31st president of the United States from 1929 to 1933. He was a world-famous mining engineer and humanitarian administrator. As a United States Commerce Secretary in the 1920s under Presidents Warren G. Harding and Calvin Coolidge, he promoted economic modernization. In the presidential election of 1928, Hoover easily won the Republican nomination. The nation was prosperous and optimistic, leading to a huge victory for Hoover over the Democrat Al Smith. A couple months after he was elected, the stock market crashed and the Great Depression was beginning. 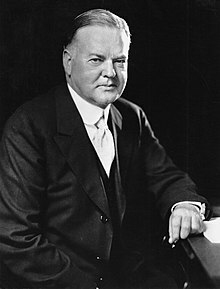 The federal government received less money in tax revenues because of the bad economy, and the government was spending more money than it was taking in, so Hoover tried to increase the government's revenue to balance the budget. He signed the Revenue Act of 1932, which was a large tax increase. He also signed the largest tariff (a tax on goods that are traded between foreign countries and the United States) increase in American history which worsened the Great Depression, even though 1000 economists warned him not to sign that. Hoover supported the very unpopular prohibition of alcohol, and did not want to make alcohol legal. Hoover died at the age of 90 in his suite in New York City from internal bleeding caused by colorectal cancer. ↑ "FIRST PUBLIC DEMONSTRATION OF INTER-CITY TELEVISION BROADCASTING". Science Service.si.ed. Retrieved November 4, 2013. This page was last changed on 20 April 2019, at 13:09.